Maybe someone somewhere is working on a Handbook of Zemstvo Postmarks and Cachets. It will be an enormous and frustrating task. 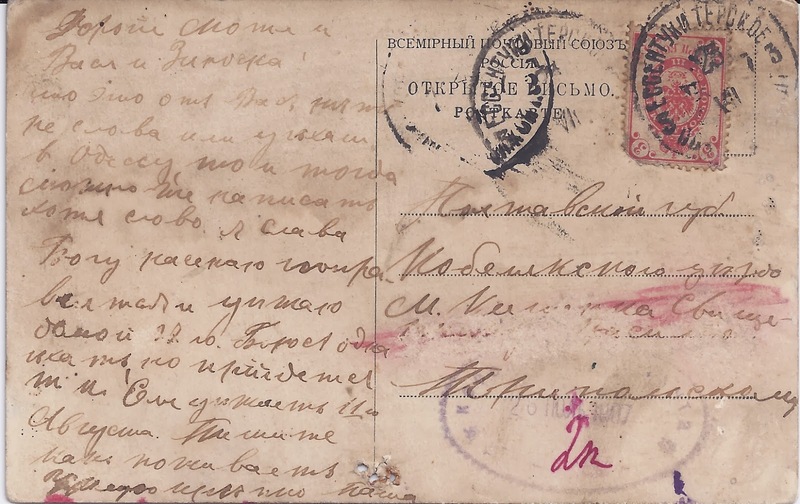 There must have been thousands of postmarks and cachets used by Zemstvo Posts - and probably 90% of them are rare. In the previous Blog I wrote about going through Flea Market boxes looking for postcards. Look through enough boxes and you will eventually find something like the item above. But what is it? It's a picture postcard of Essentuki, posted in that holiday resort on 23 VII 1907. The stamp is cancelled ESSENTUKI TERSKOE and this cancel is repeated twice to the left of the stamp. At the bottom of the card is an oval violet cachet struck in violet dated 26 JUL 1907 and with "2k" written in red ink. But the card is correctly franked at 3 kopecks so how come someone wants to raise 2 kopecks Postage Due? 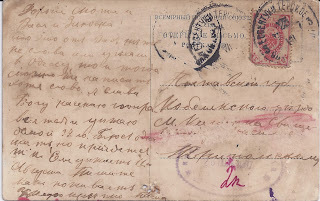 The card is addressed to Poltava guberniya (in the first line) and then to what I read as Kobelyaki uyezd (District) in the second line. After that, it gets difficult. But my guess is that the violet cachet belongs to Kobelyaki Zemstvo and that it reads KOBELYAKI ZEMSTVO POST though only the initial "KO" and the final "Ta" of POCHTa is clear. The 2 kopecks represents the fee for local delivery within the Zemstvo. The known postmarks of Kobelyaki at this period are struck in violet, they are oval, and they have a saw tooth outer frame like that on this cachet - they are however in a larger format. That's as far as I can get with Google. And the chances of one of my readers being able to show the same cachet are, I suspect, very small - but not impossible, which is why I put up today's Blog.